George H. W. Bush inherited a robust economy from Reagan. He even pledged, “Read my lips: no new taxes.” If only he had stayed faithful to that pledge. 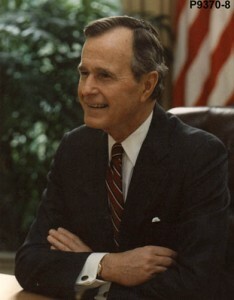 He did reject new taxes from a Democratic Congress a number of times, but as part of a budget deal in 1990, he allowed some taxes to be raised. That angered his conservative base, a base he would need in the next election. In early 1991, after the success of the Gulf War, Bush’s approval rating was at 91%. Then a downturn in the economy began to erode that approval. Now, let’s be serious here: it was just that–a downturn. It was not a recession; neither was it a depression. In the months leading up to the 1992 election, all the indicators showed an economy revived and growing again. All that had happened was a minor correction in the market, something which occurs regularly. Yet the Democratic nominee for president turned this economic “hiccup” into the Great Depression. Clinton’s campaign slogan, “It’s the economy, stupid!” became the focal point of his bid for the presidency. He called the Bush economy the worst in America in the last 50 years. Really? This required short-term memory loss. What happened to Jimmy Carter? Did everyone simply forget the late 1970s? “The worst economy in 50 years” was a blatant lie. But it set the tone for the entire Clinton presidency, where lying became an art form. Clinton can be excused for this, some say, because look how well the economy functioned during his administration. He must have been a financial genius. Two factors must be recognized here: first, a president can sometimes be the beneficiary of the policies of his predecessors; second, a president does not control the entire economy–things happen without him. Just as Reagan suffered from the Carter policies in his first two years, Clinton benefitted from Reagan’s policies that reinvigorated America. Just because Reagan left office doesn’t mean his policies and their benefits ended when he moved out of the White House. They continued through the presidencies of his successors. Clinton also found himself in the middle of the dot.com boom. The new internet technology was just coming into its own. He was hardly responsible for that. Of course, to be fair, neither was he responsible for the dot.com bust at the end of his term. The point being, Clinton really had very little to do with how America’s economy functioned during the 1990s. 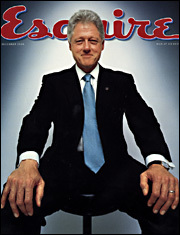 The only real economic reform during his administration was the Welfare Reform Act of 1996, for which he took credit. That was a joke. It was the Republican Congress that formulated that plan; he vetoed it at first, then signed it into law prior to the 1996 election, to bolster his reelection bid. Clinton, therefore, had little to do with the robust economy of the decade. Yet he smugly took credit for everything. A lot of people were fooled by Clinton. Are we going to see a repeat of that in this upcoming election? Is the electorate foolish? That sounds like a good topic for a future post.